The CAC Wackett trainer was the first aircraft type designed in-house by the Commonwealth Aircraft Corporation of Australia. The name was derived from its designer Lawrence Wackett. The type was designed to meet RAAF Specification 3/38 for an ab initio training aircraft. It was a tandem seat fixed tailwheel-undercarriage monoplane aircraft with a fuselage of steel tube and fabric construction and wings and tail made of wood. Despite the simplicity of the design, construction of the first of two CA-2 prototypes, begun in October 1938, was not completed until September 1939 (this was partly because CAC was still building its factory during this time period). The first prototype flew for the first time on 19 September 1939 fitted with a Gipsy Major engine. The aircraft proved to be underpowered with this engine so the second prototype was fitted with a Gipsy Six prior to its first flight in early November the same year (the first prototype was subsequently also re-engined with a Gypsy Six). Although in-flight performance was improved, the heavier engine negated any benefits to take-off performance obtained from the increased power, so the decision was made to install a Warner Scarab radial engine driving a Hamilton two bladed propeller. The two prototypes were fitted with Scarabs in mid-1940. Several months passed before the RAAF committed to the type, partly because for a time it appeared that the organisation's training needs could be met with other types already being procured. However RAAF Specification 1/40 for the "Supply of [the] CAC Wackett..." was eventually issued in August 1940 and the Wackett entered production. The first CA-6 Wackett recorded its first flight on 6 February 1941 and entered service in March that year. Supplies of Hamilton propellers, which were being manufactured locally by de Havilland Australia, and the Scarab engines, were erratic during the first half of 1941. The propeller supply problem was not fully resolved until October of that year, so many unflyable aircraft accumulated at the CAC factory at Fisherman's Bend. However during this time the opportunity was taken to incorporate modifications to the thickness of the lower wing skins that in-service use had shown were required. Following the outbreak of the Pacific War production was increased to make way for the Boomerang and the last Wackett was delivered to the Royal Australian Air Force on 22 April 1942. In the 1950s several aircraft were converted by Kingsford Smith Aviation Services Pty. Ltd. as agricultural aircraft, being re-named the KS-2 or KS-3 Cropmaster. The KS-2 had a hopper installed in the front cockpit; the single conversion was not a success so it was re-modified as the KS-3 with the hopper located in the rear cockpit. Four more Wacketts were converted to KS-3s and the type was further developed as the Yeoman Cropmaster. The Wackett served primarily with No. 1 Wireless Air Gunnery School (WAGS) at Ballarat, Victoria; 1 Elementary Flying Training School at Tamworth, New South Wales; No. 2 WAGS at Parkes, New South Wales; No. 3 WAGS at Maryborough, Queensland and No. 5 Operational Training Unit at Tocumwal, New South Wales. It also served at several other Empire Air Training Scheme establishments in Australia. 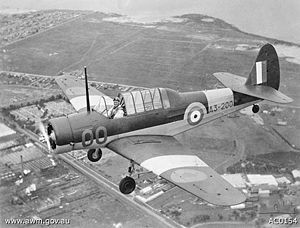 About one-third of the 200 aircraft were written-off during the type's service with the RAAF and after the end of World War II the remaining aircraft were withdrawn from use and sold to civilian individuals and organisations. About thirty aircraft were subsequently re-sold to the Netherlands East Indies Air Force and the survivors of these were transferred to the nascent Indonesian Air Force at independence, although it is thought that they did not see further use. Several dozen more were placed on the Australian civil register. On 14 January 1962 James Knight commenced a flight from Ceduna, South Australia to Cook, South Australia in Wackett VH-BEC (ex-RAAF A3-139). He was never seen again. Over three years later, on 28 March 1965, VH-BEC was found by chance two hundred miles North of Cook. Knight had remained with the aircraft after it force-landed and inscribed a diary and his Last Will and Testament on the fuselage panels; the last diary entry was made on 20 January 1962. It was subsequently determined that the mount of the magnetic compass was loose and displayed headings that were 30 degrees in error. VH-BEC was recovered in 1977 and is now on display at the Central Australian Aviation Museum. Several other Wacketts and a KS-3 Cropmaster are in other museums and in private hands in Australia. CA-2 Wackett Trainer : Prototypes. Two aircraft were built. CA-6 Wackett Trainer : Two-seat basic trainer aircraft for the RAAF. 200 aircraft were built.